They live among us. We share our earth with all the animals. They serve various purposes and they come in all shapes and sizes. Some are so cute and adorable, and others are vicious and frightening. 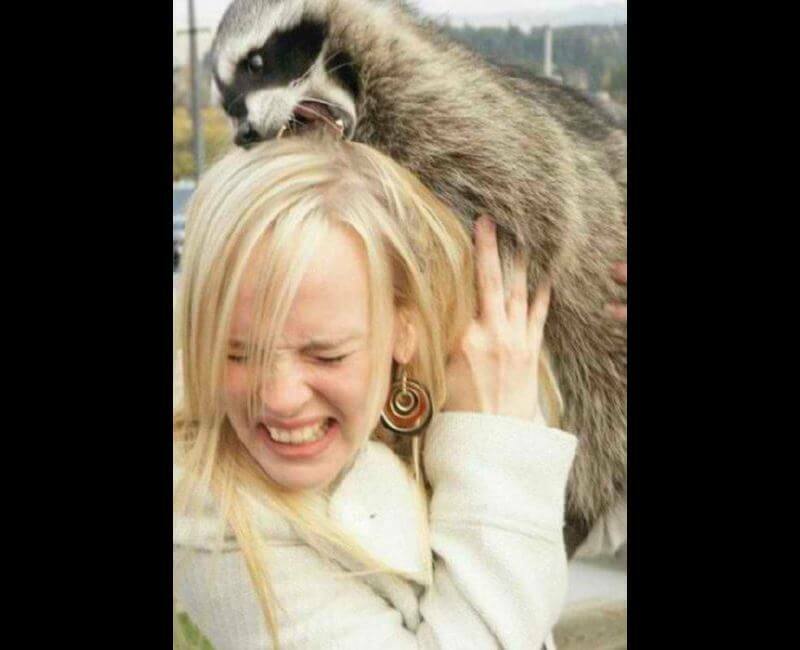 Appearances can be deceiving in the animal kingdom, and trying to take a simple photo with an animal can have unintended, and at times, deadly results. Sometimes a person may be minding their own business and an animal could come along and provide some love or some hate. Lets see how this all comes about in the following gallery. People want to capture the moment of their leisure time for their own keepsakes. Selfies are one way of capturing the moment. Some people go to the extreme with photos and sometimes what seems like the perfect photo may end up causing more harm than good in the long run. Such is the case of this particular image above. 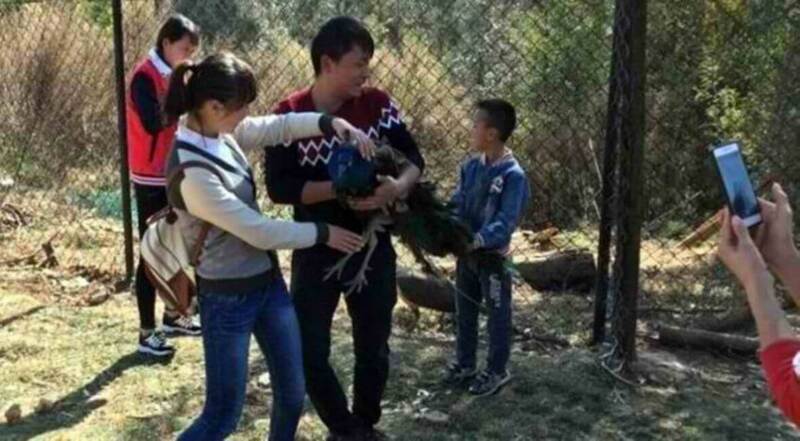 We have visitors at the Yunnan Wild Animal Park in Kunming, China. These visitors took hold of a peacock and thought that it would be fine to grab this bird and pose with it. What happened afterwards is that the peacock went into shock and it died. Isn’t he just the cutest thing? Well, not quite that cute. Some of the cuddliest looking creatures look so sweet and innocent that it is easy to forget the nature of these animals. Some animals, such as the raccoon, can be kept as pets. This really is not such a good idea since they are meant to be in the wild with other raccoons. Raccoons usually go by the buddy system. They will find food together, and if someone feeds them, they will come back to the source of where they were fed. I think this particular raccoon was in the mood for spaghetti. There seems to be a fascination with the bull in such countries as Spain and Portugal. There is also a liking toward bulls in the United States as well. The bull symbolizes power and also rowdiness. The rodeo circuit just would not be the same without a bull, and that is no bull. It is best not to stand around or even wear red when dealing with a raging bull. They tend to go crazy and try to charge everything in sight. It makes you kind of feel sorry for rodeo circus clowns. This bull just happened to go a trampling through a town in Portugal. 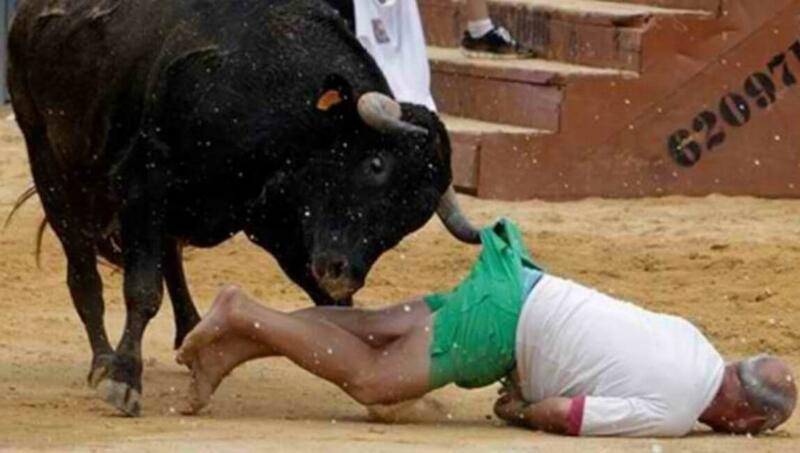 Several people were injured during the bull’s rampage including this unfortunate guy. Have You Heard of Yellow Rain? Who said that sunbathing was easy? Those who expect to absorb the sun want to relax and just soak all of those rays in. It can be so relaxing that a person may even fall asleep or do some daydreaming while trying to catch the rays of the glowing yellow sun. Speaking of yellow, there are some other unexpected things that may occur if you lay in the bare grass and sun bathe. You may get a bug or two climbing aboard your body, but that is not bad. This dog decided to take a leak on the woman’s cheek. This is Not a Merman! Sometimes there comes a time when you cannot back down. A person has to fight for their life when the moment presents itself. This image looks weird, but this could have turned into a very dangerous situation for Mick Fanning while he was in the water. Mick Fanning is a surfer who was competing in a surf competition at the J-Bay Open finals. He just happened to end up near a shark. He could have ended up as dinner for the shark, but he did something that you may not have heard of. He actually punched the shark and the shark swam away. 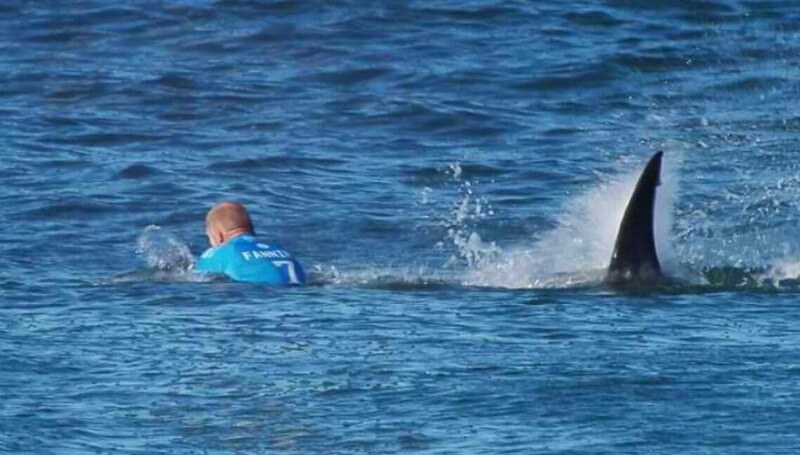 Mick Fanning was not harmed by the shark in any way. This might sound like something out of some horror film made in Hollywood. A leopard escaped from the Mahananda Wildlife Sanctuary in Bengal. While the leopard was on the loose, the whole village was put on alert. A leopard is one of the most dangerous animals alive. It can kill its prey within seconds. It will take the prey into a tree and then eat. Luckily the buddy system was in effect during this encounter. The unfortunate villager almost became a meal for this leopard, but thanks to the guy in the background with the gun, the leopard was killed. The attack victim survived the attack. You may look at this and wonder what in the world is going on in this image. Could this poor feline wanted attention this bad? Or is there another underlying cause for the cat to all of a sudden jump. This cat probably wanted to jump from one place to another, or the cat probably wanted to show off. This is one of the safer images in this article. Luckily this is not a pitbull or some wild animal leaping in this photo. Maybe the cat saw something and tried to lash out and something. 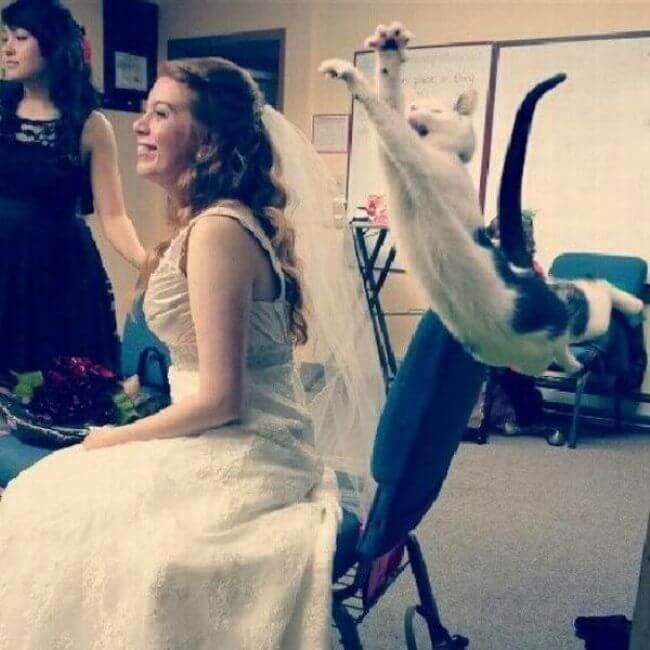 I wonder how the bride reacted. This seems like a candidate for either a humorous selfie or a total fail. Some selfies can be humorous and some are just for certain purposes such as posting the selfie to Twitter or Instagram. The lady in the photo above thought that it would be cute to take her selfie by a camel. This sounded like a good idea, but looking at the photo, it was definitely a bad idea. We really do not know how an animal is going to feel when it feels like its space is being invaded. 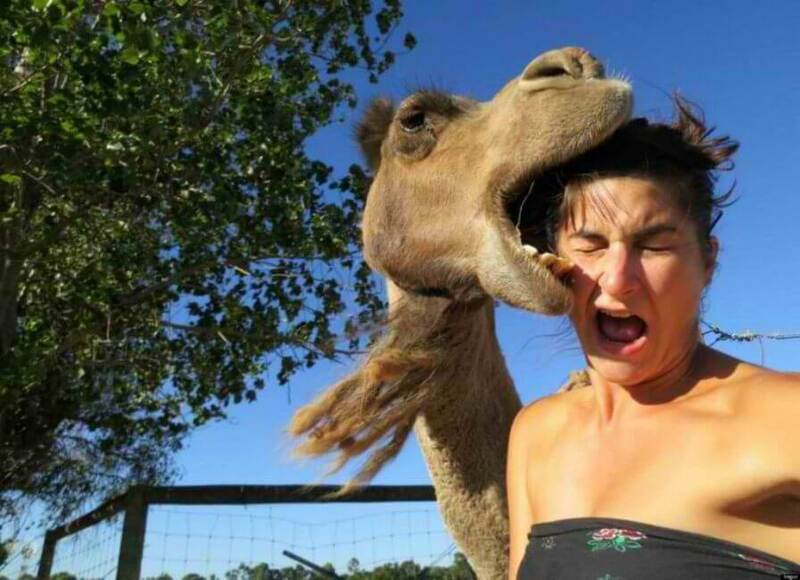 This camel just happened to be hungry and tried to take a bite out of this ladies head. The lady was not hurt in this image. This is one of the weirdest pictures that I have ever seen. It is said that an alligator will hunt anything. Some animals only hunt for other animals. The alligator is a type of animal that will hunt anything… possibly even a human being. 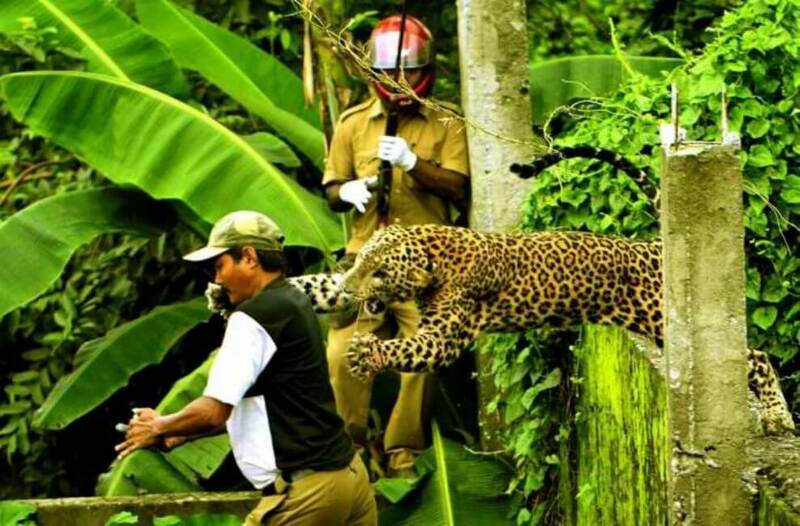 This is a pretty humorous photo, despite what could have been a dangerous situation. The policeman hopped on the car with the gun aimed at the alligator in South Florida. 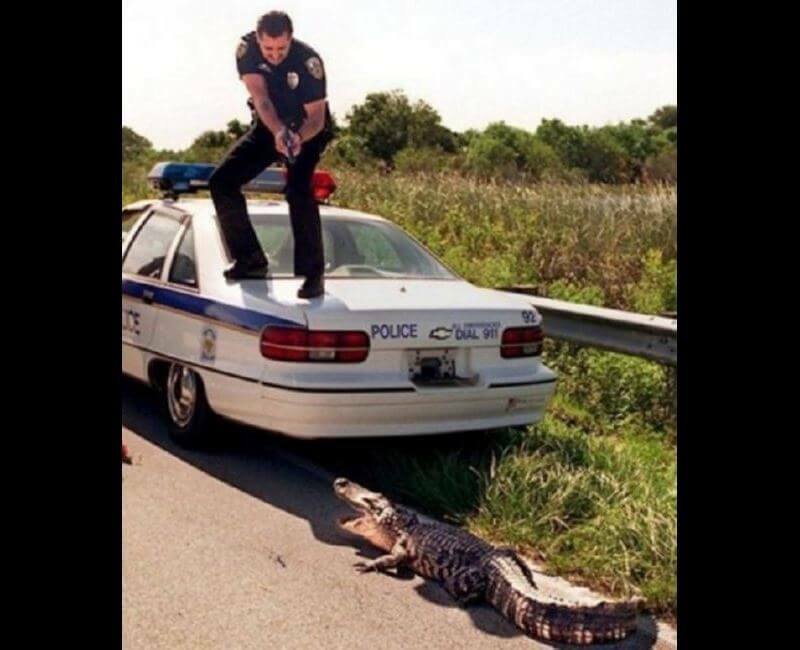 The officer is taking the right stance since the alligator is a dangerous animal who does not take kindly to humans. Talk about being between a rock and a hard place. This poor gentleman is in a very complicated situation. The tiger on average weighs about 500 pounds. The tiger is not bulky, but it is actually muscular and it has to maintain its muscle structure in order to hunt its prey. We have in this photo a poor unfortunate man who accidentally fell into the white tiger cage at the National Zoological Park.The tiger stood in front of the man and stared at the poor guy for about 15 minutes. The people above the cage made things worse because they started throwing rocks at the tiger. 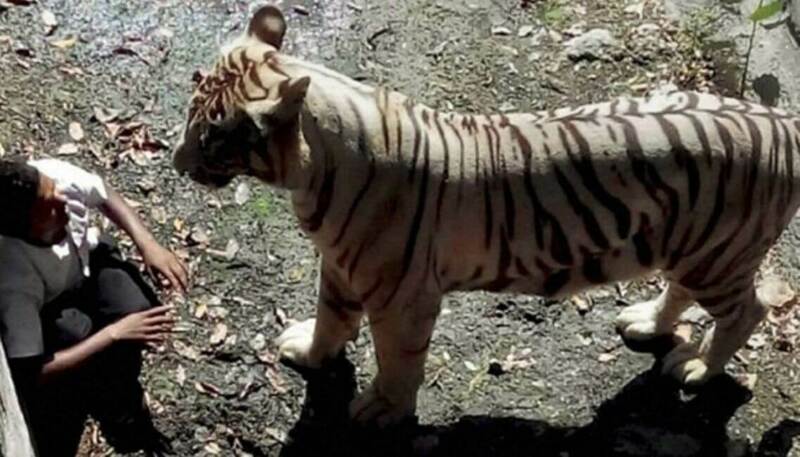 The tiger then went berserk and attacked the man. This is another one of those images that seems innocent, but the results could have been very dangerous. 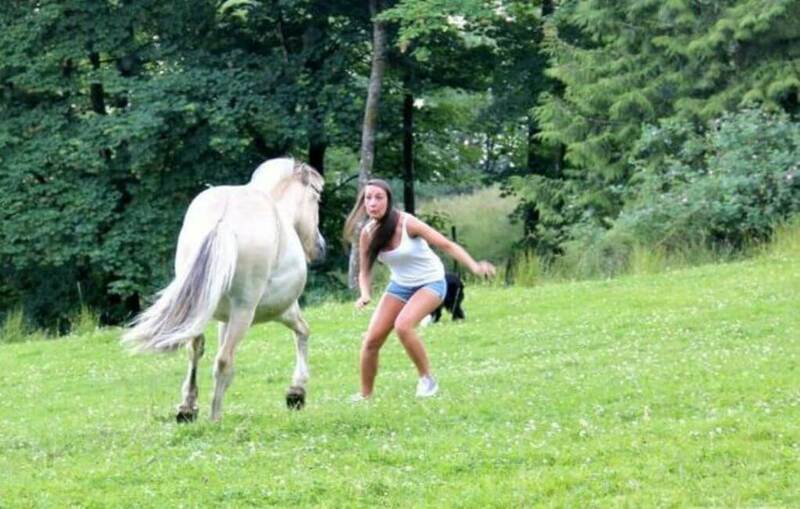 The lady in the image seems like she is trying to dodge the horse, which may seem and even sound like fun, but the horse in the photo is a wild horse. This wild horse could have been agitated by something previously and it may or may have not been agitated by the woman. A wild horse should not be ridden at all. When a wild horse gets angry, it becomes very aggressive and they can become very dangerous animals. I hope the lady’s reflexes are good. Please take heed when someone says “don’t feed the animals.” This takes away from their survival skills in a sense. Wild animals have trained all their lives to go for the gusto and hunt for their own food and they have to use those survival skills when food gets scarce. They have to use those instincts in the worst and best of times in order to survive. 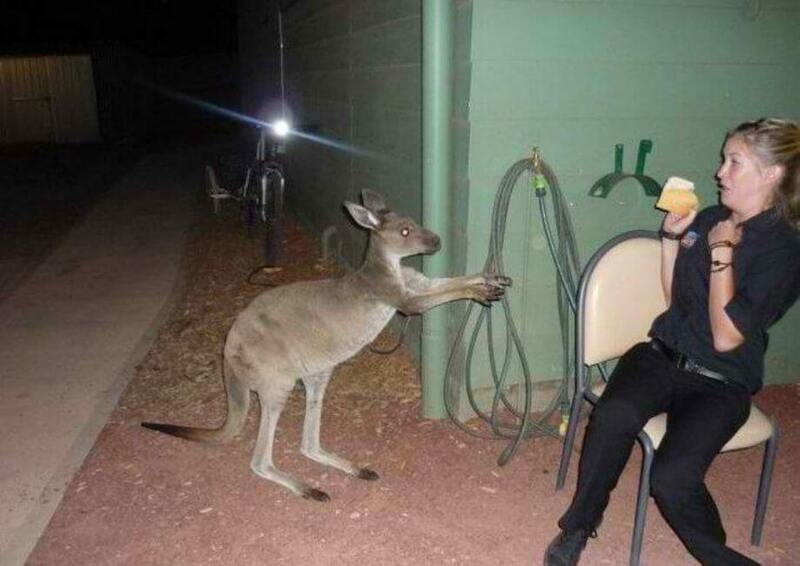 This kangaroo is use to being fed by humans, obviously, and it wants a piece of food from this woman in the image above. If one wants your food, it would be best to give it to them. This woman knows that for certain. It Ain’t No Fun When The Boar Has You On The Run! As the old saying goes, it ain’t no fun when the rabbit has the gun. This photo could be interpreted in a number of ways. One thing that probably happened is that this guy was hunting for some type of animal such as a deer or something of the kind and he was startled by the boar. The boar could have come out of nowhere and frightened the man and caused him to miss his prey. 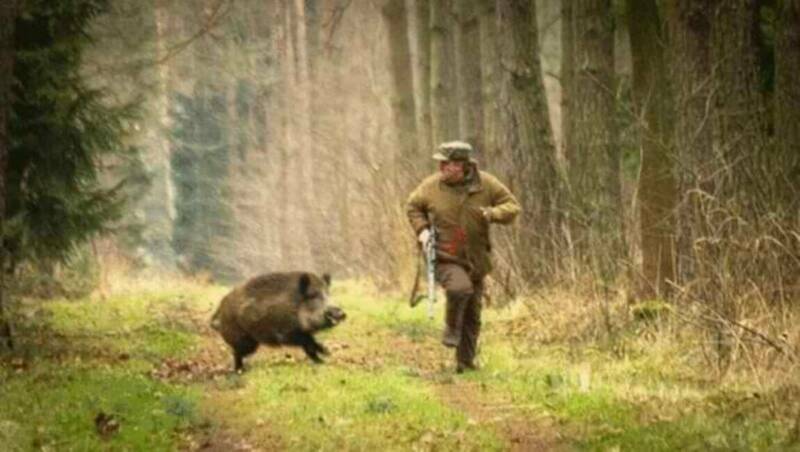 The guy in the image could have actually been hunting wild boar and the boar probably got the drop on him somehow. This is yet another humorous image with what looks like a happy ending. People just seem to love the camel. They seem like such docile creatures. They usually travel pretty slowly and they just feel like very gentle creatures. Life seems to be pretty easy for them. If you have never encountered a hungry camel, that is a very good thing. These animals are made to expend lots of energy because they are made for travel. 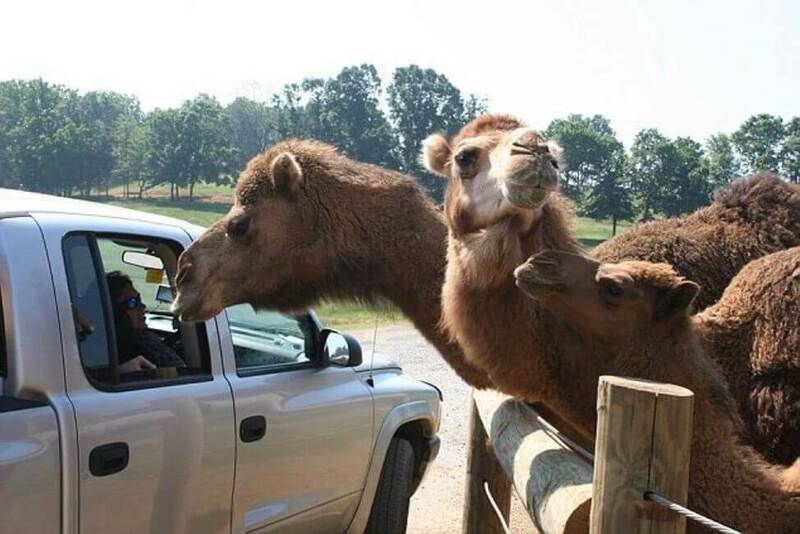 When the camel gets hungry, it becomes very-year-old girl was sitting in this vehicle and she was feeding the camels. She was bitten on her forearm as one of the camels tried to get food from her. This could have turned out entirely differently if not for the glass cage. 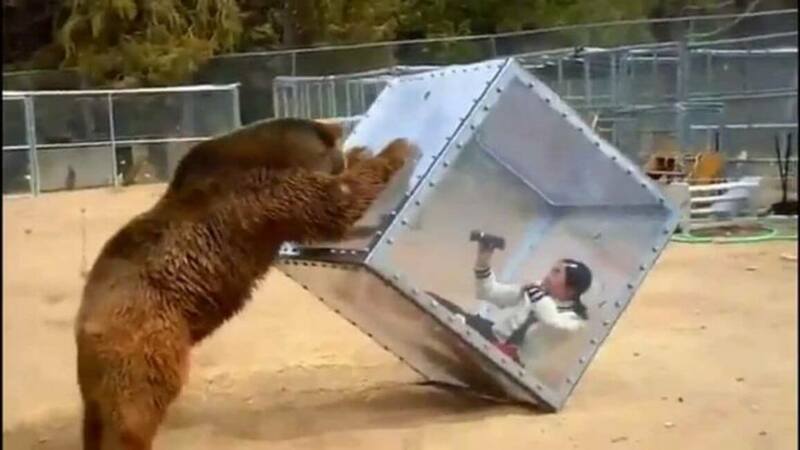 Luckily, this cage did not break on this lady while she was inside of it being “attacked” by this grizzly bear. This image is actually from an extreme game show. This show gives the name “extreme” a bad name, as this is downright insane. Whatever happened to competitive game shows that do not involve grizzly bears? The grizzly bear is the largest carnivore on the earth. This is from a game show called Predator Shield. This young lady was put in a glass cage and the grizzly bear was let loose on her. Luckily she was in the cage. No one likes to be near anyone or anything angry. Some animals have bad days just like us humans do. All of that pent up anger has to have an outlet. Animals have to break away from their confinement and take their frustrations out on the nearest people that they can find. 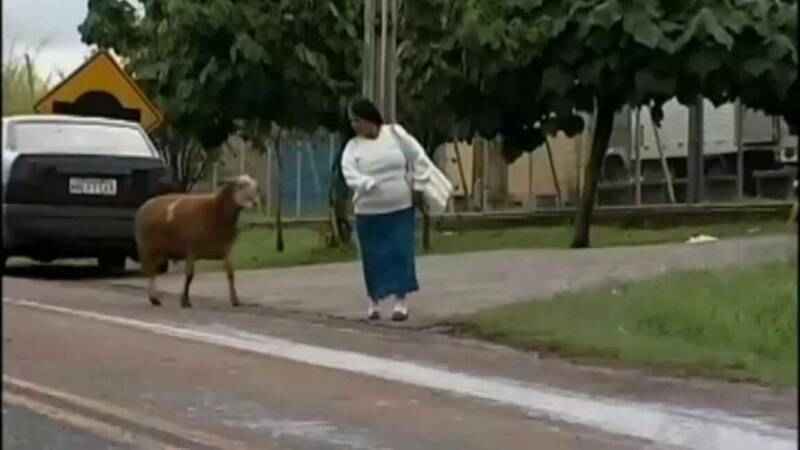 In the image above, a goat escaped from a farm in Brazil. The goat went berserk and started attacking people near a prison. It attacked several pedestrians, such as the lady in the image, and it also attacked a person on a motorcycle. The goat was probably captured and returned to the farmer. As of recent, there was a disturbance in a house somewhere in North America. Someone broke into a family’s house when the family was sleeping quietly. The house was ransacked and in total shambles. You would expect a burglar to have done this type of work but it was not a burglar who did the breaking and entering. A bear broke into someone’s house and helped itself to the family’s food. What does this mean? Never feed the bears, no matter how cuddly they seem. 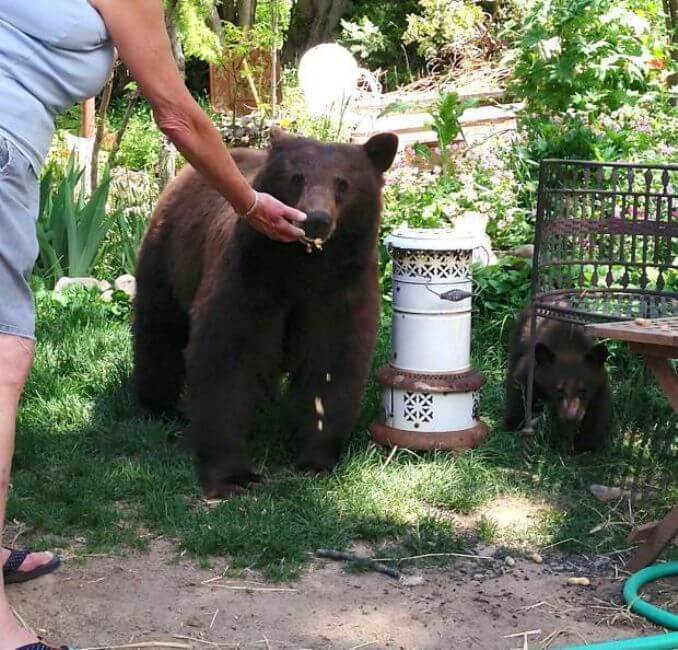 This woman fed some of these bears and she ended up being attacked by one, and suffered serious injuries when one of them attacked her from behind. Run every which way that you can! 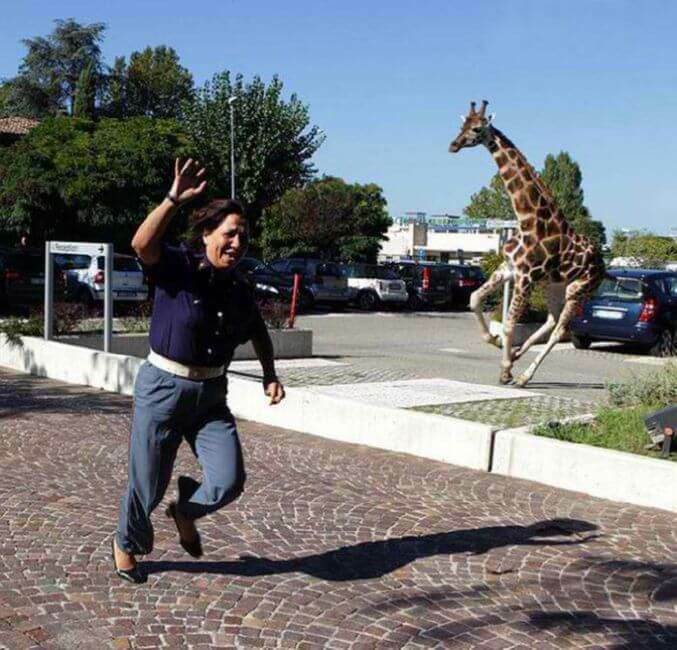 This person is running for dear life when a giraffe is coming towards them. You may think a giraffe is just a cute and sweet creature who would not do anything to harm anyone. You may see them eating a few leaves and on some occasions get chased by a lion. Let me fill you in on some information about the giraffe. The giraffe can actually kill a lion with its legs. When it is chased, it kicks back, and it can crush a lion’s skull. This giraffe escaped from the Rinaldo Orfeo Circus in Imola, Italy. In addition to chasing people, it damaged a few cars. The giraffe was given tranquilizers and returned to the circus. A child can become very curious and what seems like something fun can turn into a very dangerous situation. This scene may seem familiar. Think back to about a year ago. You may have heard of the Harambe fiasco that occurred at the Cincinnati Zoo. A three-year-old boy wanted to take a swim just out of curiosity. The child ventured away from its mother, and fell into the gorilla enclosure. 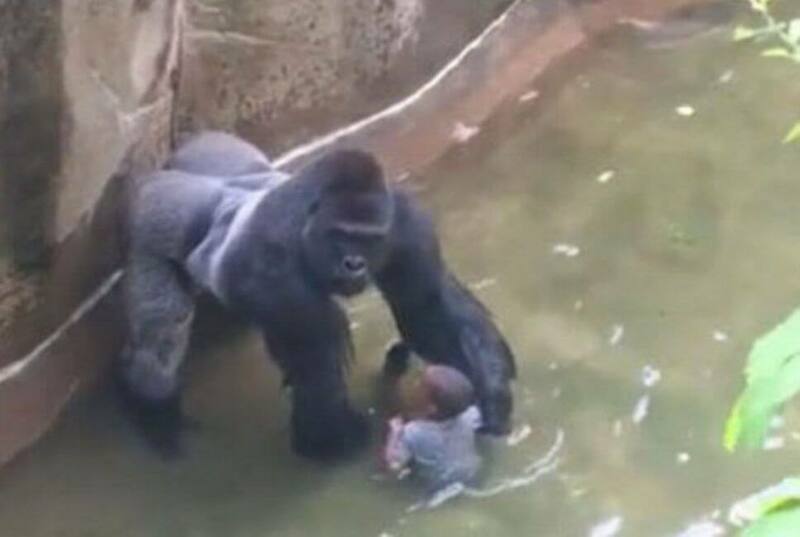 Harambe the gorilla got near the child and even grabbed the child and drug it through some water. Harambe was finally shot and killed. Many people were not happy about this and they actually blamed the parent for what happened. Some guys are just selfish when it comes to taking their selfies. I am wondering if the word “selfie” derived from the word “selfish”. This may be actual fact, especially with a photo like this. 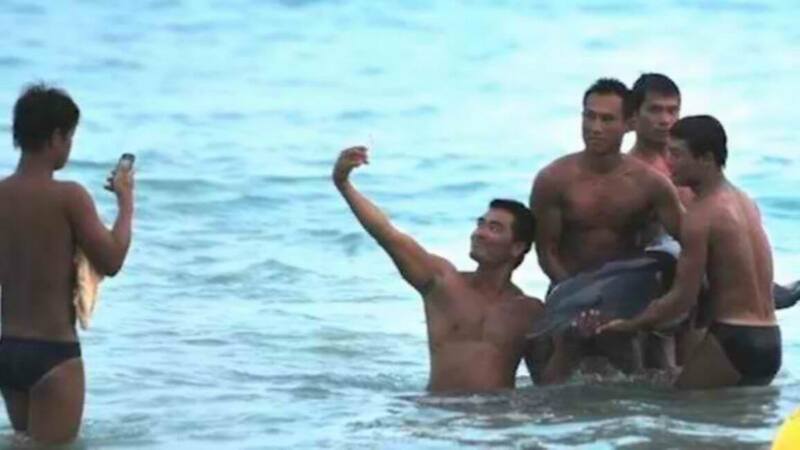 These guys seem to be having a good time with taking selfies with this dolphin. All looks well, but all was not well, especially for the dolphin. These guys were just looking for some innocent photos and more than likely their intentions were not to hurt the dolphin. They probably did not know that the dolphin was injured and the dolphin died shortly after the photo shoot because of excessive bleeding because the guys “manhandled” the dolphin.